Garlic (Allium sativum) is a member of the onion family (Alliaceae) along with onions, chives, shallots, leeks, and elephant garlic. Garlic is distinguished from other family members by its flat leaves and clove-like bulbs. Each garlic bulb contains several small scales or cloves enclosed in a white or purplish parchment-like sheath. Garlic cultivars are classified as either hardneck or softneck. Hardneck cultivars (Allium sativum var. ophioscorodon) produce a flower stalk (technically a scape) and are often termed “top-setting” or “bolting” cultivars. Flowers, if they are produced, usually abort. Bulbils (small bulblets) are produced on top of the scape. The flower stalks of some hardneck garlic are distinctly coiled. These types are referred to as rocambole or serpent garlic. Typically, hardneck garlic cultivars have 4 to 12 cloves surrounding the flower stalk. Because of the hard flower stalk, they are difficult to braid. Garlic Scapes are completely edible and considered a delicacy. Watch our recipes page for delicious ways to prepare garlic scapes. Softneck cultivars (Allium sativum var. sativum) are sometimes referred to as “artichoke” cultivars and do not produce a seed stalk. These cultivars are commonly used in California for commercial production. However, some softneck cultivars are suitable for cold climates. Softneck cultivars are generally more productive than hardnecks because all the energy goes to producing a bulb rather than a bulb and flower stalk. Bulbs have 10 to 40 cloves arranged in layers. Softneck garlic tends to have a much longer shelf life than hardneck garlic and typically can be stored for 6 to 8 months without significant deterioration. They also are easy to braid. Elephant, porcelain, or Greathead garlic is actually a type of leek (Allium ampeloprasum). Elephant garlic is much larger than true garlic, often weighing as much as 1 pound per bulb. They also store well. The taste of elephant garlic is much milder than that of true garlic, but in cold climates, it can develop a sharp or bitter taste. Open your garlic box the same day it is received! This will help prevent mold/mildew/rot, as it will allow the garlic to continue drying. Place the garlic in a cool location away from sunlight as you wait for the proper planting time. Up to 2 days prior to planting (but not longer), “shuck” the garlic. Remove the outer husks and separate the cloves, leaving the skins on the individual cloves. Store the cloves in a cool location away from sunlight. One helpful step to help avoid disease is to shuck your garlic away from your field/garden, so the dirt particles and shucks can not contaminate your soil. This may be an unnecessary precaution, but it’s an easy one to do. Therefore, we recommend shucking garlic away from your field/garden. 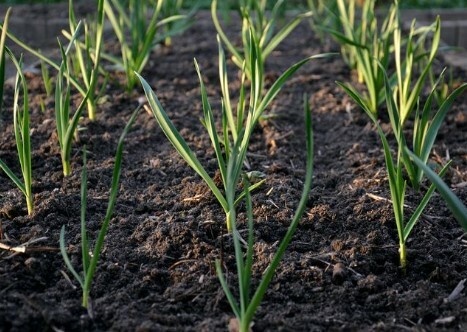 Planting Garlic: Garlic grows best in well-drained, fertile soils that are high in organic matter. Misshapen bulbs may result when garlic is grown in heavy, clay soils. Incorporating compost or well-rotted manure into heavy, clay soils can be beneficial. The optimum soil pH for garlic is between 6 and 7. Before planting, soils should be well tilled to provide a loose growing bed for bulb development. Because garlic plants do not produce true seeds, garlic is grown by planting cloves. Garlic cloves can be purchased at garden centers or from mail-order companies, through direct purchase online from growers is typically more economical. Planting cloves from garlic purchased at the grocery store is not recommended because these are usually softneck cultivars that are mainly adapted to mild climates. Additionally, most grocery store garlic has been exposed to chemicals that postpone or prevent growth for longer shelf life. Cloves should be planted in fall in most of the US (October to early November) or early spring (late March to early April). Spring-planted garlic will not likely achieve the same size as fall-planted garlic. Contact your local Extension Office or state Extension for information about planting times specific to your area. Fall-planted garlic should be mulched with a 4- to 6-inch layer of weed-seed-free straw to help prevent winter injury. In early spring, move the straw to between the rows to allow the garlic foliage to emerge and moisture to evaporate from the soil. The mulch helps control weeds during the growing season. Late spring planting results in smaller bulbs at harvest. Plant cloves with the pointed side up, root end down. When planted upside down, misshapen bulbs often develop. Plant cloves about 1 inch deep, or contact your Extension Office for recommended depth for your climate/zone. Hardneck (top-setting) garlic cultivars also may also be grown from the bulbils or bulblets. Plant the bulblets in early spring and allow to grow in the same area for 18 months. By the end of the first season, the bulblets will form “rounds” or unsegmented bulbs. Left undisturbed, they will form a cluster of cloves by the following summer. Place cloves 3 to 5 inches apart within the row. Rows should be spaced 18 to 24 inches apart. We suggest that you contact your local agricultural extension office for recommendations specific to your growing area. A list of offices, by county, can be found here: http://www.clemson.edu/extension/county/ . Garlic requires more fertilizer than many vegetables. Incorporate 1 to 2 pounds of an all-purpose garden fertilizer (10-10-10) per 100 square feet before planting. One month after planting apply an additional pound per 100 foot of row in a band 3 to 4 inches from the base of the plants. Avoid nitrogen applications after the first week of May because bulbing may be delayed. Soil tests should be taken before planting to determine phosphorus and potassium needs. If you prefer to garden naturally, try fertilizing with blood meal, bone meal, and/or fish meal. Water plants once per week during dry weather. Stop irrigating in late June to allow the foliage to yellow and die before harvest. Like an onion, garlic has a shallow root system. Weeds should be removed carefully to avoid disturbing or pulling up the garlic bulbs with the weeds. Mulches help control weeds and conserve soil moisture. Most garlic diseases are either soil- or set-borne and usually can be controlled with proper rotation and planting disease-free sets. Before planting, check each clove for signs of disease. Discard any infected cloves or bruised cloves because they may decay in the soil. Many garlic cultivars are susceptible to yellow tips. The development of yellow tips early in the season (before bulbing) may drastically reduce yields. It is usually a sign of water stress, nutrient deficiency, or disease. Insects are not a major problem for garlic production, though a few destructive pests do exist. When is it best to harvest garlic? In late spring/early summer, the garlic begins to change from a green onion-looking plant to forming bulbs. The greatest part of the size develops in the last month before harvest. Spring garlic looks similar to green onions. It has not yet begun to form cloves in mid/late April in Iowa. Spring garlic can be eaten, but of course, won’t allow you to produce as large of a quantity as if it matures before harvest. Still, it is another unique way to enjoy your garlic! Carefully dig garlic bulbs when the foliage starts to turn yellow and die, most often when half of the leaves are dying. Yellowing normally occurs between June and September (varying by climate/zone). Dry or cure the bulbs in a warm, well-ventilated, and shaded location for at least 2 to 3 weeks. After drying, remove the foliage 1 inch above the bulbs or use the foliage to braid the bulbs together. Place the bulbs in a mesh bag or open crate and store where it is cool (32–40°F) and dry (65–70% relative humidity). Softneck types can be stored for 6 months or more, whereas hardneck types may only store for approximately 3-5 months. More about how to store garlic here.